Among the 10 states chosen by the Centre to kick-start its "Make in India" campaign is Tamil Nadu. 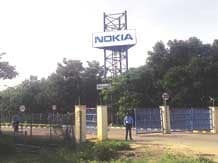 Despite the closure of the Nokia unit followed by Foxconn suspending its operations in the state, the state government insists that all is well and that, driven by the automobile industry, the manufacturing sector will continue to grow. Experts, however, are of the opinion that given the negative sentiment and with competition mounting from neighbouring states, Tamil Nadu needs to be more pro-active in wooing investors. Tamil Nadu is the second largest state economy and the second most industrialised state after Maharashtra. In 2013-14, its manufacturing sector growth at 3.53 per cent was higher than the country's growth rate for the sector at 0.71 per cent. In terms of gross domestic production, the state's Industry Minister P Thangamani says Tamil Nadu at 7.94 per cent was way ahead of the national growth rate of 4.94 per cent in 2013-14. At 42,000, the state boasted of the highest number of factories in 2014 across segments: automobiles and components, castings and forgings, pumps and motors, garments and textiles, leather, and chemicals and plastics, to name a few. Along with Maharashtra and Gujarat, it is also one of the three states whose manufacturing sector is comparable with that of upper middle-income countries. The state has attracted Rs 44,402 crore in foreign direct investment (FDI) in the last three years and has seen the signing of 33 memorandums of understanding worth Rs 31,706 crore since May 2011, of which Rs 14,305 crore has been invested. While the numbers point to a thriving manufacturing sector in Tamil Nadu, experts and industry leaders are worried that the political situation, power shortage and competition from neighbouring states, especially Andhra Pradesh, could come in the way of growth. Kumar Kandaswami, senior director, Deloitte India, says Tamil Nadu lags other states when it comes to product innovation and scaling up its companies. Barely a handful of companies operating in the state have a turnover of $ 1 billion, even though they have been in existence for decades, he adds. Land acquisition is a challenge too because Tamil Nadu is one of the most urbanised states of India and, therefore, land prices there are sky high. The other obstacle is that about 60 per cent of the state's industrial production happens within 150 km of Chennai. To push industrialisation beyond its capital, the state will need to create social infrastructure beyond Chennai to attract migrant workers. However, with the power situation in the state's hinterland being grim, the task won't be easy. 6 million vehicles annually by 2020. Though it has traditionally been a sound manufacturing base for auto and auto components, Tamil Nadu must address power issues, bring about transparency and make bureaucrats more accessible to people, says V Narasimhan, chairman (manufacturing committee) of the Confederation of Indian Industry's Southern Region. He says till a few months ago, the state was also missing a strong leadership, but things are now beginning to look up. "Nothing is lost. If we move fast, we can regain what we have lost," he adds. At a meeting with industrialists in Coimbatore last month, Thangamani said, "The state government is with you and will develop infrastructure to meet the need of the industries. There may be some delay in clearances or creating necessary infrastructure, but the government wants to provide all the facilities to make Tamil Nadu as the most industry-friendly state in India." This assurance reportedly came after complaints from industrialists that since J Jayalalithaa stepped down as chief minister, no files had been moving and the process of getting approvals had become tedious. The state's political situation had witnessed an upheaval following the arrest of Jayalalithaa while she was the chief minister. The political instability the arrest caused had industrialists worried. Allaying their fears, Thangamani said, "Our ultimate goal is to realise the state's Vision 2023." Vision 2023 sets a target of 14 per cent growth per annum in the manufacturing sector and aims to attract investment of Rs 15 lakh crore across all sectors by 2023. The minister said that in the next two years, the state expected an investment commitment of Rs 1 lakh crore, a major chunk of which would come from the automobile industry. Thangamani added that the Tamil Nadu government's target was to increase its automobile production capacity to six million units by 2020. The current capacity is 3.55 million units. But the question is: Where will this investment come from? Ford, one of the early original equipment manufacturers (OEM) that set up factory near Chennai, has chosen Gujarat for its second facility. It said it was moving out of the state to be closer to other markets in the country. Hyundai, despite running its plant at 98 per cent capacity, is yet to announce its expansion plans and though the company has denied it, there is speculation that it might be exploring opportunities in Rajasthan or Gujarat. Mahindra & Mahindra, which was supposed to invest Rs 4,000 crore to set up an automotive plant, is yet to get land. Isuzu and Peugeot have decided to invest in Andhra Pradesh and Gujarat, respectively. France-based glass maker Saint-Gobain, whose first plant was set up near Chennai, has also decided to expand its manufacturing capacity by setting up a Rs 1,000-crore manufacturing facility in Bhiwadi, Rajasthan. And the Andhra Pradesh government recently approved Ramco Cement's 2.5 million-tonne plant in Kurnool district. To a question on competition from Andhra Pradesh, Karnataka, Madhya Pradesh and Gujarat, Thangamani said, "People will stone the tree that bears a large number of fruits." There are signs the state is gearing up to portray Tamil Nadu in a brighter light to investors. Recently, it unveiled an automobile policy that focuses on the future development and consolidation of the automobile and components industry. These are areas where the state enjoys a comparative advantage. To attract more investment in hardware manufacturing, the state has set up an expert committee with representatives from the industry to evaluate the potential and advise the government on the way forward. The state government is also planning to bring out new bio-tech and textile policies. Tamil Nadu clearly does not want to lose out in the "Make in India" race.